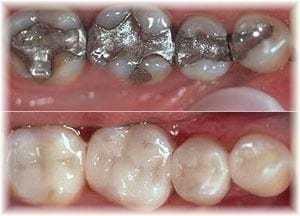 Amalgam Fillings with mercury need to be removed, but how can this be done? Looking for a local Mercury Free Dentist? Mercury or Amalgam Free Dentists can be hard to find. We are a holistic dental practice with dentists who are experienced in removing silver fillings. We have four IAOMT certified dentists in our holistic dental clinic. Drs Kimberly Baer, and Jennifer Tipograph are certified by the IAOMT in Amalgam Techniques. We use the IAOMT protocol as shown for Amalgam Removal in the video. Natural Dentist Associates has been a Mercury Free and Fluoride Free dental office for over 20 years. We take great pride in the dental and overall health of our patients. In the video below we show the equipment we use in our office and how we care for our patients before and after your mercury removal visit. Dental fillings that contain more than 50% mercury. Mercury removal should be done in a manner for the benefit of the patient and the dental office team. The IAOMT protocol involves the use of a latex-free dental dam, high-speed suction, filtration of mercury gas, lots of water and an alternate source of oxygen gas. • Cut Filling material in Large Pieces – the chances of inhalation or ingestion of smaller mercury particles and vapor are greater than the larger ones. Therefore, removal of fillings should be done in larger chunks, so as to minimize the harmful effects of mercury. • The Cooler the Better –the use of a dental hand-piece during the dental procedure can lead to an increase in the local temperature, directly resulting in an increased generation and emission of the mercury aerosol and the release of more mercury gas. Therefore, it is best to use sufficient water irrigation and air cooling. • Efficient Suctioning – a high volume evacuation can ensure that most of the mercury vapor is absorbed, and not allowed to accumulate into the dental office or worse yet be breathed by the patient. • Protective Barriers – while rubber dams can be instrumental in preventing mercury ingestion or inhalation, very fine particles can slip right through them. Therefore, usage of a rubber dam, in addition to thorough water irrigation and suction can provide enhanced results. • Provide Clean Air – to prevent the patient from breathing the air full of amalgam splatter and mercury gas, pure oxygen, in combination with other methods can be provided with the help of a positive pressure respiration device. We offer IV Sedation Dentistry for mercury removal in Rockville Maryland. Patients who are calm during a procedure heal and detox faster. Many dentists will offer charcoal pre-treatment and recommend detoxification with Vitamin C, Glutathione and other things. Mercury is a very toxic substance to your body and it can cause many health issues. Mercury can be released into the body in several different ways including: chewing, drinking hot liquids, and teeth grinding. But one of the most dangerous ways it is released is the through the removal of mercury fillings. When drilling there is a release of mercury gas. It is very important to use a special filtration system and proper amalgam removal protocol to avoid mercury exposure. We can replace your old fillings with porcelain or another non-toxic resin material. 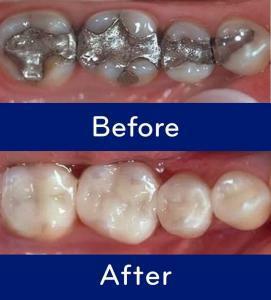 Some larger silver fillings may need to be replaced with crowns. We use metal-free zirconia crowns. Zirconia us known to be one of the most biocompatible materials available in dentistry. Removal of Silver Mercury Fillings from the patients mouth so they are no longer exposed to Mercury. It is impossible to detox from Mercury if you have Mercury fillings in your mouth. Health Benefits for the Dentist and staff who are not exposed to Mercury. Environmental Benefits because the mercury and other metal toxins are filtered and removed from the environment and NOT allowed to go down the drain and into the public water system. • Use Nitrile Gloves – Conventionally used rubber gloves are unable to prevent the diffusion of amalgam and mercury particles. Hence, specially designed nitrile rubber gloves are suitable for this purpose. • Breath Clean Air – just like it is important for the patient to breath an air free of harmful particles, it is equally, rather more important for the dental team to breath a clean air, as they have to perform amalgam removing procedures on daily basis. Unfortunately, the routinely used paper masks are of no use, hence the best method is to use positive pressure inhalation with the help of industrial respirators, commonly available at the safety equipment stores. • Filtration – professional air purifiers can be used to filter the air in the dental office to be free of mercury vapor and other harmful particles generated during amalgam removal. • Supplemental Evacuation – to further minimize mercury vapor generation, a vacuum can be used that throws the aerosol into the exterior, thereby ensuring minimal vapor concentration within the dental office. • Watch where it Goes – the story does not end here, and all the waste generated from removal of mercury fillings must be properly stored, sealed and disposed of according to the standards of the Occupational Health and Safety Administration (OSHA) agency. 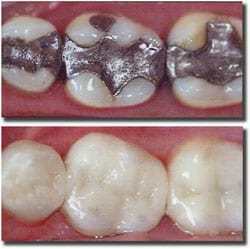 Amalgam fillings are made of about 50% mercury and a 50% mix of tin, silver, and copper. Most of us had them placed when we were kids but now with more material options and the fillings breaking down the question is often, “When should I replace my amalgams”. All too often we wait too long and a root canal or extractions are our only options. Your metal fillings are over 10 years old. At the ten year mark, the margins on the fillings start to break down leaving a small gap between the filling and the tooth. This area allows leakage and over time decay starts to form under the metal filling. Amalgam Filling material will slowly separate over time since amalgams do not bond to the tooth structure but are held in place with retention. You have any metal sensitivity issues. 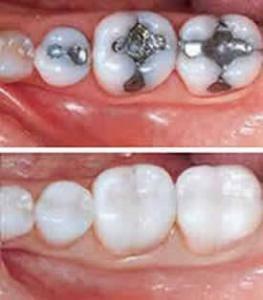 It is very common to have sensitivity to one or more of the metals that are in amalgam fillings. There are inexpensive lab tests to verify this and determine the ideal material to use with your fillings. There is no safe amount of mercury exposure across the board. Some people cannot tolerate a small amount while other it does not seem to have such an effect. At what point it becomes a problem varies. The one thing we know is that you do not want any exposure if possible. There is also the issue of the battery effect that the metals in your mouth cause. You grind or clench your teeth. The debate with silver fillings starts with the issue of their mercury content. We know that it is released as a vapor when heated. This happens when we drill on silver fillings and that is why it is important to take special precautions when having them removed. They are also heated up when we grind on them. Teeth grinding (bruxism) is a common issue and should be considered when replacing your fillings. Your fillings have become sensitive. Amalgams weaken your tooth structure by contracting and expanding with changing temperatures. Heat causes expansion which we see in thermometer. Over the years you develop small cracks around your old fillings till eventually pieces start to come off. At this point crowns, root canals, and extractions are needed. It is better to treat these areas early to avoid larger restorations. Your teeth have started to fracture around your fillings. This can happen and you do not feel a thing. If your fillings are large then it may require a crown to restore the tooth and avoid a root canal or extractions. If the filling covers more than 50% of the chewing surface a crown may be your best option. Especially when the fillings are large if you do not replace then when needed you will eventually need more extensive dental treatment. Your best bet is to get an exam from your dentist and make a plan to restore your teeth. Waiting for treatment leads to more costly work, more extensive treatment needs and a higher likelihood you will lose teeth. The materials we have to use for dental work today have great advantages. Patients who clench and grind their teeth can be challenging cases. Tooth Wear or specifically wear of the enamel including cracking, chipping and abrading of the enamel will predispose teeth to decay and will prematurely break down existing filling materials. In the picture below, the yellow area adjacent to the Metal filling is where all of the white enamel has been worn away, exposing the underlying Dentin. The Metal Filling is also crumbling and separating from the tooth. All of this damage was caused by a TMJ problem. TMJ or TMD is defined as a misalignment between the best fit of the teeth and the path of closure of the jaw. The misalignment causes tooth clenching and grinding or Bruxism. TMJ or TMD problems can be diagnosed and cured by a specially trained TMJ Dentist. Many painful TMJ conditions are caused by upper airway conditions and can be corrected with ALF or DNA Appliances. The DNA appliance is an appliance capable of balancing a bad bite and expanding the airway through palatal expansion. The DNA appliance can be used in some cases to correct or cure Sleep Apnea. Does Dental Insurance Pay for Mercury Filling Replacement? It really depends on the specific insurance plan, whether or not Silver Filling Removal is covered by Dental Insurance. Natural Dentist Associates includes the Mercury / Silver Filling Removal as apart of a dental filling replacement fee. Some dental offices will charge a separate fee for Removal of a Silver Metal Filling. Natural Dentist Associates does not charge a separate fee for Metal Filling Removal. A typical Dental PPO insurance will cover 80% of the cost of the Filling Removal. Most Insurance plans have a annual maximum benefit such as $1500-$5000 at which point the patient will need to pay for 100% of the fee. Some Insurance plans have a maximum allowable charge and others will pay on a pre-determined fee schedule. At Natural Dentist Associates, we have insurance professionals in the office who will contact your insurance company and determine how your insurance works in our dental office. Many organizations exist and encourage Mercury Free Dentist. The international association of Mercury Free Dentists, The International Association of Mercury Safe Dentists, Biological Dentist Directory, Mercury Safe Dentists Directory, Mercury Safe Dentists of Maryland, IAOMT, and many others. Many other associations support the removal of amalgam fillings: Holistic Dental Association, Homeopathic Dentist Association. Maryland Homeopathic Holistic Dentists.